Information retrieval (IR) is the activity of obtaining information resources relevant to an information need from a collection of information resources. Searches can be based on full-text or other content-based indexing. Automated information retrieval systems are used to reduce what has been called "information overload". Many universities and public libraries use IR systems to provide access to books, journals and other documents. Web search engines are the most visible IR applications. The evaluation of an information retrieval system is the process of assessing how well a system meets the information needs of its users. Traditional evaluation metrics, designed for Boolean retrieval or top-k retrieval, include precision and recall. Many more measures for evaluating the performance of information retrieval systems have also been proposed. In general, measurement considers a collection of documents to be searched and a search query. All common measures described here assume a ground truth notion of relevancy: every document is known to be either relevant or non-relevant to a particular query. In practice, queries may be ill-posed and there may be different shades of relevancy. Virtually all modern evaluation metrics (e.g., mean average precision, discounted cumulative gain) are designed for ranked retrieval without any explicit rank cutoff, taking into account the relative order of the documents retrieved by the search engines and giving more weight to documents returned at higher ranks. Precision is the fraction of the documents retrieved that are relevant to the user's information need. In binary classification, precision is analogous to positive predictive value. Precision takes all retrieved documents into account. It can also be evaluated at a given cut-off rank, considering only the topmost results returned by the system. This measure is called precision at n or P@n.
Note that the meaning and usage of "precision" in the field of information retrieval differs from the definition of accuracy and precision within other branches of science and statistics. Recall is the fraction of the documents that are relevant to the query that are successfully retrieved. In binary classification, recall is often called sensitivity. So it can be looked at as the probability that a relevant document is retrieved by the query. It is trivial to achieve recall of 100% by returning all documents in response to any query. Therefore, recall alone is not enough but one needs to measure the number of non-relevant documents also, for example by computing the precision. In binary classification, fall-out is closely related to specificity and is equal to . It can be looked at as the probability that a non-relevant document is retrieved by the query. It is trivial to achieve fall-out of 0% by returning zero documents in response to any query. This is also known as the measure, because recall and precision are evenly weighted. Two other commonly used F measures are the measure, which weights recall twice as much as precision, and the measure, which weights precision twice as much as recall. F-measure can be a better single metric when compared to precision and recall; both precision and recall give different information that can complement each other when combined. If one of them excels more than the other, F-measure will reflect it. where is the rank in the sequence of retrieved documents, is the number of retrieved documents, is the precision at cut-off in the list, and is the change in recall from items to . where is an indicator function equaling 1 if the item at rank is a relevant document, zero otherwise. Note that the average is over all relevant documents and the relevant documents not retrieved get a precision score of zero. An alternative is to derive an analytical function by assuming a particular parametric distribution for the underlying decision values. For example, a binormal precision-recall curve can be obtained by assuming decision values in both classes to follow a Gaussian distribution. For modern (Web-scale) information retrieval, recall is no longer a meaningful metric, as many queries have thousands of relevant documents, and few users will be interested in reading all of them. Precision at k documents (P@k) is still a useful metric (e.g., P@10 or "Precision at 10" corresponds to the number of relevant results on the first search results page), but fails to take into account the positions of the relevant documents among the top k. Another shortcoming is that on a query with fewer relevant results than k, even a perfect system will have a score less than 1. It is easier to score manually since only the top k results need to be examined to determine if they are relevant or not. R-precision requires knowing all documents that are relevant to a query. The number of relevant documents, , is used as the cutoff for calculation, and this varies from query to query. For example, if there are 15 documents relevant to "red" in a corpus (R=15), R-precision for "red" looks at the top 15 documents returned, counts the number that are relevant turns that into a relevancy fraction: . Precision is equal to recall at the R-th position. Empirically, this measure is often highly correlated to mean average precision. Mean average precision for a set of queries is the mean of the average precision scores for each query. where Q is the number of queries. DCG uses a graded relevance scale of documents from the result set to evaluate the usefulness, or gain, of a document based on its position in the result list. The premise of DCG is that highly relevant documents appearing lower in a search result list should be penalized as the graded relevance value is reduced logarithmically proportional to the position of the result. The nDCG values for all queries can be averaged to obtain a measure of the average performance of a ranking algorithm. Note that in a perfect ranking algorithm, the will be the same as the producing an nDCG of 1.0. All nDCG calculations are then relative values on the interval 0.0 to 1.0 and so are cross-query comparable. ↑ Foote, Jonathan (1999). "An overview of audio information retrieval". Multimedia Systems. Springer. ↑ Beel, Jöran; Gipp, Bela; Stiller, Jan-Olaf (2009). Information Retrieval On Mind Maps - What Could It Be Good For?. Proceedings of the 5th International Conference on Collaborative Computing: Networking, Applications and Worksharing (CollaborateCom'09). Washington, DC: IEEE. 1 2 Singhal, Amit (2001). 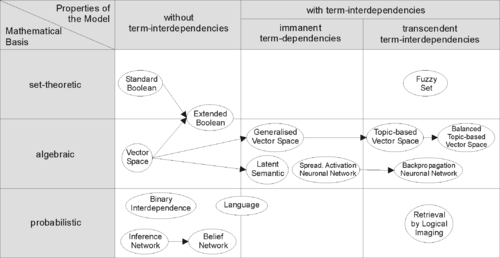 "Modern Information Retrieval: A Brief Overview" (PDF). Bulletin of the IEEE Computer Society Technical Committee on Data Engineering. 24 (4): 35–43. ↑ Mark Sanderson & W. Bruce Croft (2012). "The History of Information Retrieval Research". Proceedings of the IEEE. 100: 1444–1451. doi:10.1109/jproc.2012.2189916. ↑ JE Holmstrom (1948). "'Section III. Opening Plenary Session". The Royal Society Scientific Information Conference, 21 June-2 July 1948: report and papers submitted: 85. 1 2 Zhu, Mu (2004). "Recall, Precision and Average Precision" (PDF). ↑ Turpin, Andrew; Scholer, Falk (2006). "User performance versus precision measures for simple search tasks". Proceedings of the 29th Annual international ACM SIGIR Conference on Research and Development in information Retrieval (Seattle, WA, August 06–11, 2006). New York, NY: ACM: 11–18. doi:10.1145/1148170.1148176. ISBN 1-59593-369-7. 1 2 Everingham, Mark; Van Gool, Luc; Williams, Christopher K. I.; Winn, John; Zisserman, Andrew (June 2010). "The PASCAL Visual Object Classes (VOC) Challenge" (PDF). International Journal of Computer Vision. Springer. 88 (2): 303–338. doi:10.1007/s11263-009-0275-4. Retrieved 2011-08-29. 1 2 Manning, Christopher D.; Raghavan, Prabhakar; Schütze, Hinrich (2008). Introduction to Information Retrieval. Cambridge University Press. ↑ K.H. Brodersen, C.S. Ong, K.E. Stephan, J.M. Buhmann (2010). The binormal assumption on precision-recall curves. Proceedings of the 20th International Conference on Pattern Recognition, 4263-4266. ↑ Fawcett, Tom (2006). "An Introduction to ROC Analysis" (PDF). Pattern Recognition Letters. 27 (8): 861 – 874. doi:10.1016/j.patrec.2005.10.010. ↑ Powers, David M W (2011). "Evaluation: From Precision, Recall and F-Measure to ROC, Informedness, Markedness & Correlation" (PDF). Journal of Machine Learning Technologies. 2 (1): 37–63. ↑ Ting, Kai Ming (2011). Encyclopedia of machine learning. Springer. ISBN 978-0-387-30164-8. ↑ Mooers, Calvin N.; The Theory of Digital Handling of Non-numerical Information and its Implications to Machine Economics (Zator Technical Bulletin No. 48), cited in Fairthorne, R. A. (1958). "Automatic Retrieval of Recorded Information". The Computer Journal. 1 (1): 37. doi:10.1093/comjnl/1.1.36. ↑ Doyle, Lauren; Becker, Joseph (1975). Information Retrieval and Processing. Melville. pp. 410 pp. ISBN 0-471-22151-1. ↑ "Machine literature searching X. Machine language; factors underlying its design and development". doi:10.1002/asi.5090060411. ↑ Maron, Melvin E. (2008). "An Historical Note on the Origins of Probabilistic Indexing" (PDF). Information Processing and Management. 44 (2): 971–972. doi:10.1016/j.ipm.2007.02.012. ↑ N. Jardine, C.J. van Rijsbergen (December 1971). "The use of hierarchic clustering in information retrieval". Information Storage and Retrieval. 7 (5): 217–240. doi:10.1016/0020-0271(71)90051-9. ↑ Doszkocs, T.E. & Rapp, B.A. (1979). "Searching MEDLINE in English: a Prototype User Inter-face with Natural Language Query, Ranked Output, and relevance feedback," In: Proceedings of the ASIS Annual Meeting, 16: 131-139. ↑ Korfhage, Robert R. (1997). Information Storage and Retrieval. Wiley. pp. 368 pp. ISBN 978-0-471-14338-3. ↑ "Center for Intelligent Information Retrieval | UMass Amherst". ciir.cs.umass.edu. Retrieved 2016-07-29. ↑ "University of Glasgow - Schools - School of Computing Science - Research - Research overview - Information Retrieval". www.gla.ac.uk. Retrieved 2016-07-29. ↑ "ILPS - information and language processing systems". ILPS. Retrieved 2016-07-29.